When it comes to holiday door decor, the wreath is king. I would like to suggest, however, a different category of door adornment for your front porch this year—the banner! Banners are really easy to make, and they make a big statement because of their size. Throw in a holiday phrase and you got yourself a big dose of front porch Christmas cheer! We’re teaming up again with the (incredibly sweet) people over at Jo-Ann Fabric and Craft Stores to bring this simple little (big) banner project to life! First you’ll want to use an X-Acto knife to cut your phrase letters out of foam core or cardboard. You can either print a letter from your computer in a font and size that you like (I used Function Pro Bold) and trace it onto the foam core, or you can draw your own letter directly onto it. I made my letters around 8″ tall. Use a hot glue gun to glue the letters (right side facing down) onto a piece of your sheet moss. Cut around each letter with scissors when the glue has set. Cut out a large rectangle shape from your felt that is 17″ wide and 6′ long. You can cut a triangle out of the bottom of the rectangle so you get a banner look or leave it squared. Use fabric glue to glue the ribbon down the center of the banner. Secure your moss letters with the hot glue gun. Hang your wreath hangers 15″ apart over the door with the hook sides facing inward instead of out. 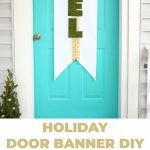 Drape your banner over the top of the door, adjust how low you want the banner to hang, and glue the banner onto the back of the metal hangers. WOW! This looks so different from anything else I’ve ever seen! The moss idea is gorgeous and looks so earthy and natural. Genius idea, Laura. I love how this looks against the turquoise door! So cute! Agreeing with Cat on this one! It’s a truly unique idea. Thanks for sharing. Love this! What a fun idea! And you could change up the colors and the words depending on the holiday! Too fun! What an awesome idea! I love anything that shifts away from the traditional wreath. Thank you!! So creative… and you’re right, it doesn’t look like anyone else’s door. Love it! Cuuuuuuuuuute! Burlap would be amazing also! This is absolutely beautiful! And I love that the colours aren’t your typical christmasy ones – very fresh. Love how this is different the the other doors on the block! Wreaths are nice, but so are different fun decor pieces. This is such a creative use of moss! Great DIY thanks for sharing this one with us! Keep ’em coming! I actually set alarms for myself for 3am (melbourne, aus) just so i can have a quick check for more lovely posts on here! Ive been following you lovely ladies since i was 16, (four years?!) And am absolutely loving the new additions to the team! Recently bought the blog life e course and am so happy with my purchase – you guys do such great work!! Hi, it looks so great. I just wanted to tell you that Noel in french is written Noël with the 2 dots on the e.
haha pun! I like this idea a lot. Wreaths are not my thing, but I would definitely give this a try! Aw, thanks Ruby! Sorry to get you up so early! Hey Laura! I love your banner, it really does stand out against the blue door’s backdrop. Now, I see you chose the French word for Christmas for your own mysterious reason 🙂 but did you know that the E in Noël has two dots on it? In French, so that two vowel sounds don’t merge together, the one we want to stand out gets a diaresis (two little dots on top). Now, just making a snob out of myself, I know…. Your banner is cool even without them.